Today I’m very happy to receive at From Pemberley to Milton one of my favourite authors, Nicole Clarkston. She has always been a very special author to me because she writes both Pride and Prejudice and North and South fan fiction books, but after releasing These Dreams, a book with Portuguese characters and settings, she has definitely conquered a place in my heart that will always remain hers! I will never forget Amália and her story, and who knows…maybe one day the author will present me with a prequel 🙂 Until that day comes, I get the satisfaction of reading more and more stories penned by Nicole Clarkston with Elizabeth and Darcy assuming the primary roles, such as London Holiday. This book could not be more different from These Dreams, but it is equally good! It is entertaining, romantic and an easy read. I would invite you to read my review of it so you may know how much I loved it!!! This scene was one that I was itching to write in London Holiday, but it would have disrupted the flow of the story. For that reason, I left it untouched, so the final chapters of the book remained all about Darcy and Elizabeth. However, I could not help but snicker when I wondered how Darcy’s conversation with Mr Bennet might have gone. “Indeed?” Bennet’s right eyebrow quirked, so very like his daughter that Darcy could not help but smile. “My good man,” Bennet chuckled, shaking his head, “perhaps you do not know what you are about. My Lizzy is rather fetching, but she is a headstrong girl, and not likely to submit willingly when I tell her I have given her away to a man I have never set eyes upon before this morning, on the recommendation of little more than a settlement document.” Bennet waved his hand, chortling as if Darcy had just provided his amusement for the day, and made as if he would stand again. “I expect you already know what you wish on that head,” Darcy confessed slowly. “Mr Bennet,” Darcy rose, provoked at last beyond civility, “have you some accusation to make against me? It is plain to me that you are well acquainted with the circumstances of my introduction to Miss Elizabeth. Allow me to be perfectly clear, sir. I am not a man to be trifled with, as I see you are bent on doing. I will not be made a subject of your amusement, but if you demand some proof of my determination, if you doubt the depth of my attachment to Miss Elizabeth, I shall accept any challenge or offer any proof you demand, up to mounting the back of your dilapidated carriage and riding it all the way to London. I grow impatient with your jests, sir, and now I ask—” Darcy paused, halted in his defensive tirade by the tearful laughter of the older gentleman. “Far from it.” Bennet turned and withdrew a small flask of Scotch from his cabinet, then tilted it in a silent offer of gentlemanly hospitality. Bennet’s eyes fairly sparkled like a young girl’s. “Marvellous,” he breathed. He lifted his glass for another long, thoughtful draught. 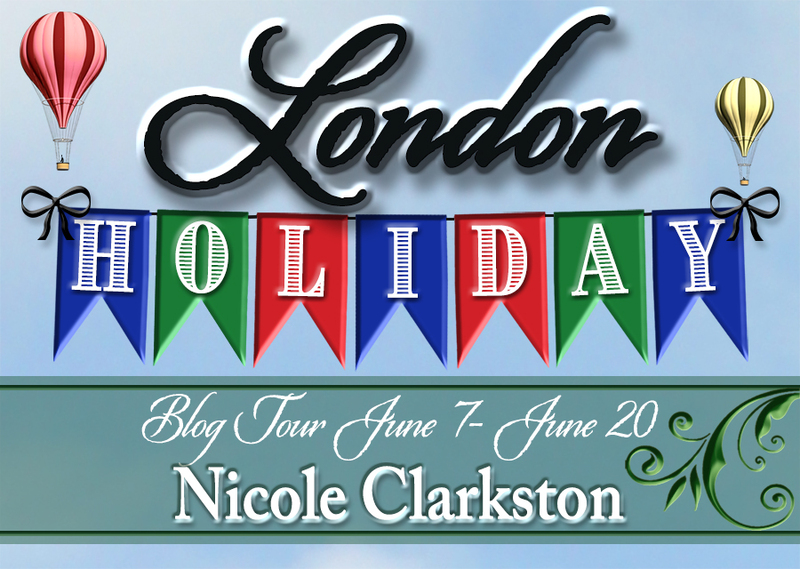 Nicole Clarkston is offering her readers 8 ebook copies of London Holiday, readers may enter the drawing by tweeting once a day and daily commenting on a blog post or review that has a giveaway attached for the tour. Entrants must provide the name of the blog where they commented. Remember: Tweet and comment once daily to earn extra entries. 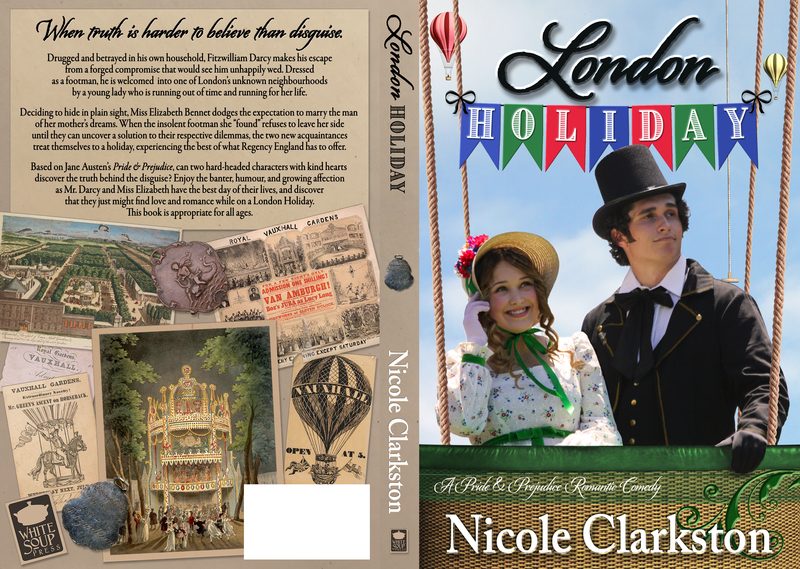 A winner may win ONLY 1 (ONE) eBook of London Holiday by Nicole Clarkston. Each winner will be randomly selected by Rafflecopter and the giveaway is international. Yes,I can well imagine this conversation between these two men,one privy,in general,to the initial meeting and foundation of the blossoming romance and the other privy,in a much more intimate way,to the specifics that saw friendship bloom into love!! Poor Darcy!! Having to suffer the sly and vexing cross examination at the hands of a master!!! I loved it! Yes,it would probably have disturbed the flow of the story as it gained momentum and then delivered a happy resolution. However,it was a wonderful,worthwhile snippet into the first meeting of these two very important men in Lizzy’s life. I am glad you enjoyed it, Mary! I have always wondered how those two gents would get on. Thanks for sharing this vignette with us, Nicole. It was a lot of fun, even though Mr. Bennet was certainly giving Darcy the runaround there! I guess I can somewhat understand it, when he learns how little time they’ve actually spent together but at least he gets the right answers. Yes, and poor Darcy couldn’t confess the whole truth, with all its gory details, without making Elizabeth look badly. Not a great way to impress a prospective father in law! Glad you enjoyed it, Anji. I absolutely loved this. Poor Darcy! Still at least Mr Bennet knows he is seriously in love with Elizabeth even if he did torment him into revealing it. I’m so sorry this wasn’t in the book but thank you so much for sharing it. The funny part was that Mr Bennet had already told Elizabeth that beggars couldn’t be choosers, so he knew he would give his blessing the moment an eligible chap knocked on his door. He was just being a pill! This is such a delightful vignette. Nicole, you know I have been desiring to know how that conversation would have gone ever since reading about them having one in the book. Just loved this. Thank you so much for sharing it with us and giving us the ‘insect on the wall’ view of their encounter/conversation. Thanks Rita, for hosting! I am glad I left this scene until now, but it was fun to be a fly on the wall! I’ve always wondered how their talks might have gone. Wow, an outtake! Thank you! What a lovely treat! Darcy is in the unenviable position of being a target for Mr. Bennet (and being in the wrong to a degree but not knowing how much he should disclose), but I liked how he stands up to him and shows his wit to tease back about libraries! Poor guy! Mr Bennet can be a rascal. It was fun to watch them vie for the upper hand! That’s for sharing the vignette with us, Nicole. A hot air balloon also featured in Collins Hemingway’s “The Marriage of Miss Jane Austen”. Had you read that yet? No, I need to! I don’t read as much when I am on a writing jag. It’s time for a break, isn’t it? Well, I suppose that as you rest upon your laurels, you could do so while reading! I have read and loved all the previous books from Nicole Clarkston so I am sure I will love this one too! Thank you for the giveaway! 🙂 And that was a wonderful outtake! You are so kind, Daniela. I hope you enjoy this one! Dear Jeanne, thank you so much! It was fun to write a light story, and I am glad I was finally able to write this scene. You are so kind, and thank you for all your support. Loved this vignette! Thank you for sharing it with us, Nicole! It’s fun reading those scenes that couldn’t be included. Thank you, Maria! I do enjoy all the scenes too. Vignettes are some of my favorite things to write. This vignette is so humourous and entertaining, Nicole. Why don’t use consider to include this scene at the end of the novel as a bonus? I’m sure readers would undoubtedly love it. And do they really have hot air balloons during Regency times? I thought it is a Victorian invention. That is a fun idea, Luthien! I thought the same thing about hot air balloons when I began my research, but they were a popular feature at Vauxhall Gardens beginning in the late eighteenth century. There is another post coming about hot air balloons, later in the tour! Oh, you have to love Mr Bennet! I hope you enjoy the book! Oh, Mr. Bennet, how can you trival with Mr. Darcy like this! Isn’t he awful? He makes me giggle every time I hear him in my head! What a great vignette. Thanks for sharing.